Resulting from an exhaustive design research as well as from good advice of a highly specialized clientele - as fishing enthusiasts are - Aquatim 680 is the new Aquamar fisherman. The yard expressly dedicates this boat to extremely demanding boat lovers who prefer unregistered boats (translator's note: In Italy, registration of boats less than 10 meters long is not compulsory). Aquatim 680 was conceived as a workboat, with a carefully hand- stratified hull, stiffened by a solid integrated structure. Another positive feature is the cabling: tension rods, electrical cables and whatever tends to make confusion in blind areas and in lockers clearly run without getting in the way and, above all, are easily identified. 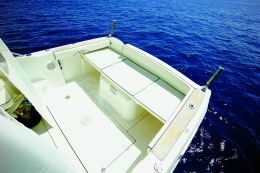 Common spaces dedicated to life on board are not limited by the fisherman design thanks to practical expedients such as cockpit seats concealed when not in use or swimming ladder compartment in the aft platform. 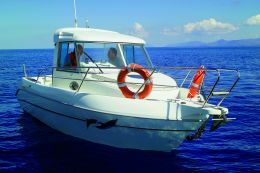 Such features are available for anyone who enjoys sailing or sun-tanning and not just fishing. 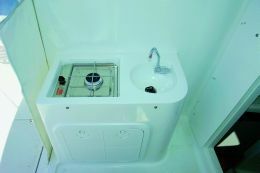 The fully fitted galley is molded in the wheel station/dinette. Belowdecks there is the cabin and a small but useful head for greater comfort and for dripping slickers. Under way, Aquatim 680 shows exceptional seakeeping abilities and the stern drive, in combination with the 160 hp Volvo Penta D-3 engine, are appropriate. 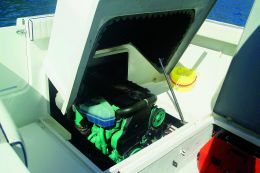 Fitting just one engine, and eventually adding an auxiliary outboard engine to obtain a continuous low speed for live-bait fishing, was the best solution for enhancing the hull design. 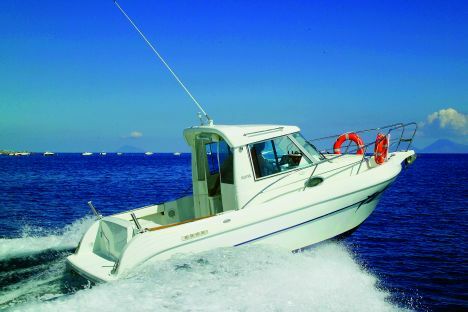 Price with standard fittings and test boat power: Euro 45.580,00 + VAT 20% ex yard. Electrical switchboard and plants: adequate.